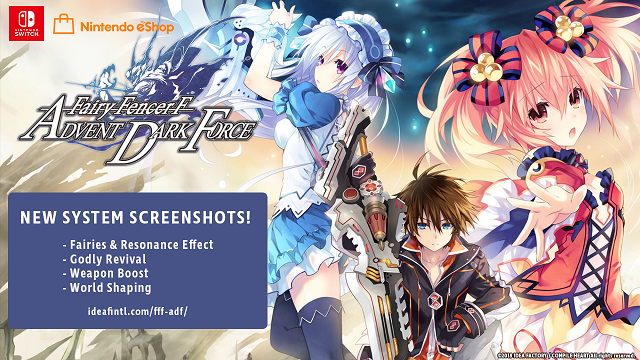 Fairy Fencer F: Dark Advent Force which will be coming soon to the Switch will be getting some new system screenshots. First up is Resonance Effect which imbues a fury with the strength of a fairy. Doing this can increase a fencer’s stats and gain new abilities. There is also Godly Revival which will allow you to unleash a fury embedded in the Goddess and Vile God. This will have the fury’s ability be passed onto a fairy. This is an irreversible action that will undo seals that’ll effect the game’s ending. Next up is Weapon Boost that lets you customize your furies with weapon points earned in battles. Lastly, there is World Shaping which lets you find ways into new dungeons and carry different effects into them. Additionally, the game will be discounted in price for the first two weeks after its launch. Fairy Fencer F: Advent Dark Force will be coming to the Switch in January. It is currently available on the PlayStation 4 and Steam.